But here it is nonetheless: Coin Knights is the last game I’ve worked on since Super Screaming Skull Bros 2, this time along with Simon Cutajar, inspired by the arcade cabinet made by the RedGrim boys. All done, as usual per game jam standards, in under 48 hours. 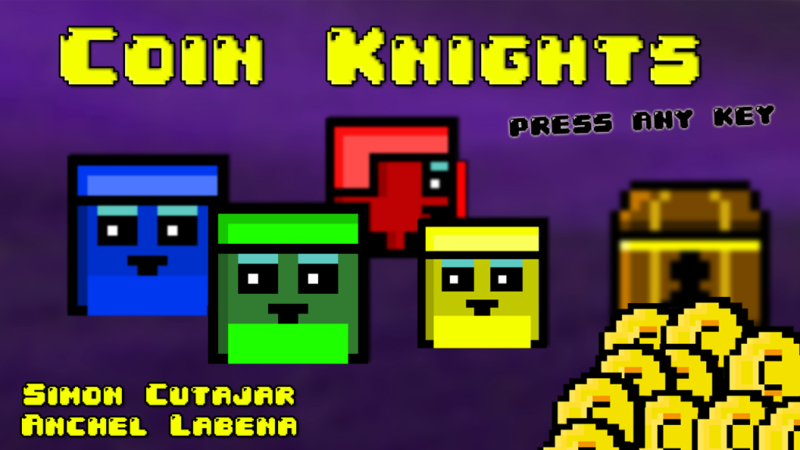 But whereas the previous game was a 2 player co-op experience, Coin Knights is a 4 player competitive game where each one of these brightly colored and blocky knights will have to collect the highest amount of coins possible before the time runs out. Simple enough, but there’s a bit more to it. The central theme, given by the Exile Game Jam restrictions, was uncertainty, and we addedgreedto that (one of the themes that were also commented at Exile). Players will have to fight each other to collect the treasure chests, get the coins inside (which can appear randomly in groups of 10, 20, 30, 50 or 100 coins) and bring them back to the castle. Players can hold up to 4 treasures at the same time. 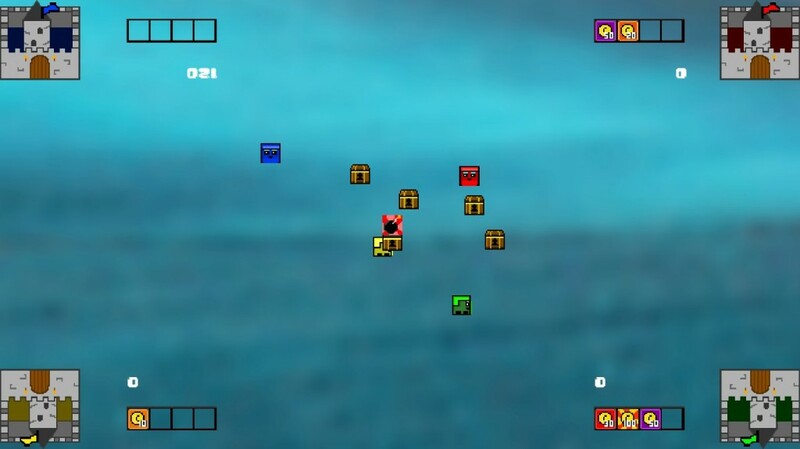 The catch is that the contents of the chests are unknown to the player until opened, and if the player is too greedy he might stumble upon a bomb. And a bomb will, simply enough, make him lose all the coins he has collected. So players will have to decide whether to keep collecting coins or bring what they have so far to their castles so as not to risk losing it all. 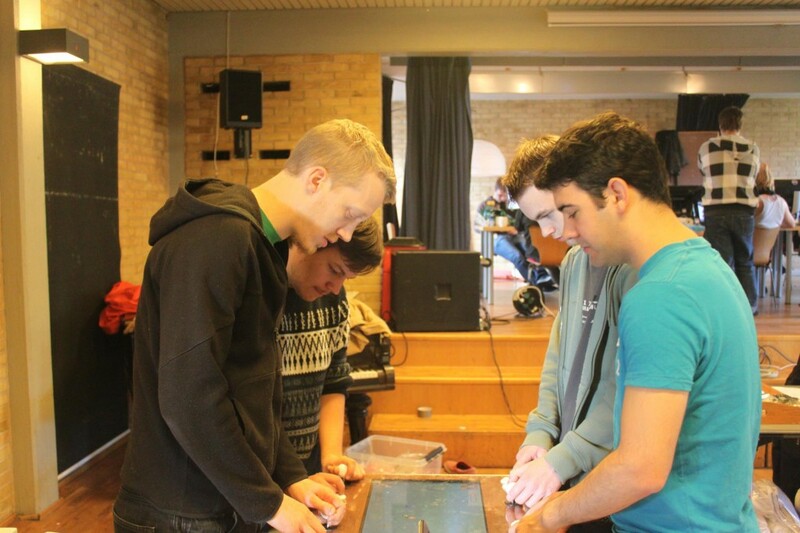 Oh, and players can push each other away by using their shields. Or steal the contents of a chest before they are collected by a player. Unluckily for us the game was not finished on time thanks to an untimely bug caused by the randomly spawning treasure chests, which totally crashes the game sometimes before reaching the time limit. Hopefully both Simon and I will be able to further polish the game, fixing bugs and adding a few more power-ups that will make the gameplay more chaotic (personally I also want to increase the size of all the sprites so that the action is bigger and crazier). Simon and I worked on the design of the game from the very beginning, with him later on focusing on the programming and music side while I made all the graphics and sound effects. For now you can play the current version of Coin Knights here!